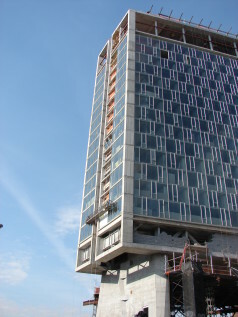 The Standard Hotel - Jon Wickers Construction Co. Inc.
Jon Wickers Co. Inc. worked with the GC at the Standard Hotel in the downtown Manhattan Meat-Packing District. The project required extremely complicated rigging. This was required on the lower section of the building which is set on the piers, creating an absence of a Building Facade to support the swing scaffolds. Jon Wickers Company designed a trolley line suspension system to float the Swing Staging to the Upper floors.